Steel King's economical, light-duty cantilever racks are used in hand loading applications. Manually accessed loads are stored easily and securely in these industrial storage racks. Don’t mistake light duty for "light" construction. Steel King doesn’t cut corners on structural integrity. Standard duty cantilever racks are available in a wide variety of sizes and capacities, these standard duty cantilever racks present an assortment of storage solutions. Choose any style for simple installation, low maintenance, and rugged operation. Steel King manufactures heavy-duty, high-quality cantilever racks designed to organize a lumber yard, distribution center, warehouse, factory, or pipe yard. When you store bulky, long loads like metal sheets, flake board, drywall sheets, etc in piles on the floor or ground, you create organizational, safety, and productivity issues. First, your workers have to sort unrelated heavy and bulky items. Secondly, they have to deal with product damage, since floor stacking offers absolutely no protection. With Steel King cantilever racks, each load item is capable of being sorted by size and type. The payoff in space savings, efficiency, picking speed, and saved product is very quick. Easier to use: With no front column in the way, cantilever racks are faster to load and unload, lowering handling time and costs. More flexible: Loads may be placed anywhere along the entire length of a row on a cantilever rack. More compact: The lack of a front column saves horizontal space normally lost to rack structure. Handling clearance is also more abundant. More selective: Any load or storage slot is immediately accessible. 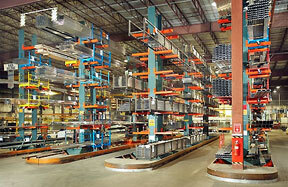 More economical: Both reduced handling times and increased space utilization make cantilever racks more cost-efficient. Additionally, cantilever racks become more economical as load length increases, while standard pallet racks increase in costs. More adaptable: Cantilever racks can store nearly any type of load. They are especially useful for storing long, bulky, or oddly-shaped loads.